What is Neville Gafà’s real job? Neville Gafà, who last week denied he had meetings in Libya as the Prime Minister’s “special envoy”, says he works at the Health Ministry despite the minister saying otherwise. The business card (front and back) produced by Neville Gafà. Mr Gafà, who works for the government, hit the headlines last week when the Libyan government’s communication office and the Libyan Interior Ministry said he had meetings in Tripoli in his capacity of “special envoy of the Prime Minister”. According to the statements, the “special envoy” discussed national security, the war on fuel smuggling and other matters with a number of Libyan ministers in a series of meetings. Mr Gafà denied having used any diplomatic designation and said he had travelled to Libya on a “personal trip”, meeting ministers who were “friends”. 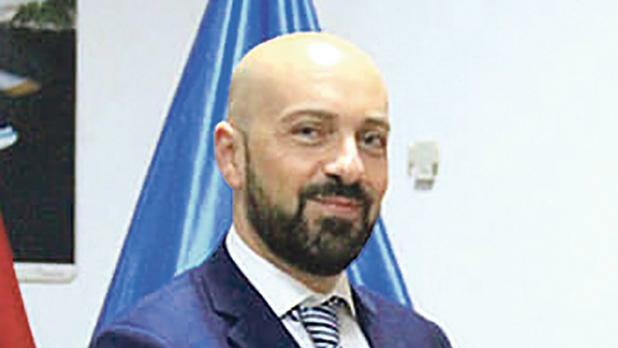 A spokesman for the Office of the Prime Minister had said Mr Gafà did not hold any official meetings in Libya on behalf of the Maltese government. Asked for his official designation, Mr Gafà told the Times of Malta he worked at the Health Ministry in Valletta as “Projects director”. 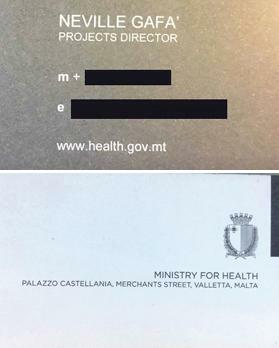 He sent Times of Malta an image of the back of his business card featuring the Health Ministry’s Valletta address. However, sources at the Health Ministry said Mr Gafà had not worked in the Merchants Street ministry building ever since he was implicated in an alleged medical visas racket in 2016. At the time, this newspaper had reported on a whistleblower’s letter which had detailed the alleged racket and claimed that Mr Gafà charged Libyans thousands of euros for a visa to live on the island. Shortly after the reports, Mr Gafà had been moved out of the ministry and sent to the Foundation for Medical Services, pending a police investigation which eventually found no proof of wrongdoing. Sources said that, since then, Mr Gafà’s old office had been occupied by another official and that, as far as they knew, he had been working at the Office of the Prime Minister at the Auberge de Castille in a capacity unrelated to the Health Ministry. He would not comment further. Sources later said the business card produced by Mr Gafà appeared outdated because they had been modified about a year-and-a-half ago toadd the words ‘Office of the Deputy Prime Minister’. This newspaper reported last year that Mr Gafà had been given duties at the Office of the Prime Minister’s customer care unit. Despite reportedly working from Castille, Mr Gafà, a member of the Labour Party’s executive, is known to be paid as manager of the Foundation for Medical Services. Meanwhile, Mr Gafà has described Libyan media reports that he had dodged Libyan security officials at a Tripoli airport as “fake news”. He insisted he had flown to Tunisia from Mitiga airport in Tripoli using a Libyan airline.